Our long stay at the hospital brought some unexpected friendships and connections with other families who were struggling to "keep things together", just as we were. As parents, we were able to share each other's small triumphs and sometimes encourage one another on the days when our children were particularly sick or going through painful treatments. We could relate to one another better than other families who thankfully never had to endure watching their child suffer with terminal illnesses. I don't know anything more heartbreaking than the loss of a child. Nothing. We came so close to losing our Jaymun. When I see photos of him in the PICU, the suffocating fear of his near death can still make me hold my breath. We met families who lost their children, their raw pain etched clearly on their grief-filled faces. What words do you offer someone who has lived in the same world of medical jargon and sterile conditions as you, whose grief runs parallel with your own day after day? What hope do you infuse them with when their precious child has fought so hard to battle an evil disease, only to have the life drained from them in the end? There is no salve to apply to the fresh pain of having a beloved son or daughter taken from this world. 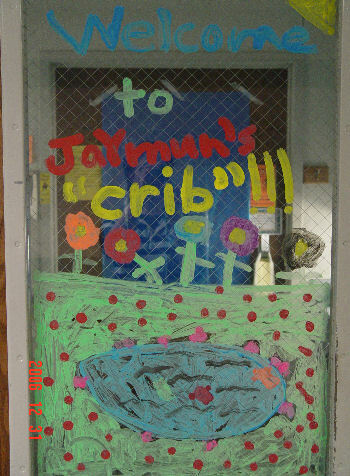 Jaymun's birth was so highly anticipated that the leukemia diagnosis really jarred us all into a sense of surreal existence. Bringing him home has reminded me of all the months that we were in a way "cheated" of enjoying our new baby. 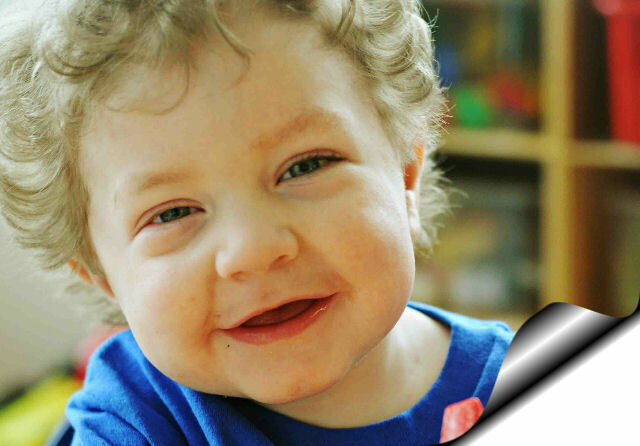 He was supposed to have spent his first six months of life surrounded by loving siblings, not exposed to chemotherapy treatments. What should have been a time of joy became a time of fear and endless worry. We had to quickly adapt to hospital life for the sake of the other children. Their visits became the bright spots in the week for me and a chance for Jaymun to connect with his siblings. The amount of living space created a real problem--our hospital room wasn't exactly a suite and there wasn't even enough seats for everyone to sit comfortably. Then there was the tricky issue of Jaymun being a baby who needed frequent naps in quiet surroundings. Four restless children are bound to create some noise! A couple of weeks ago, some people approached us in the hallway after watching Devon paint. 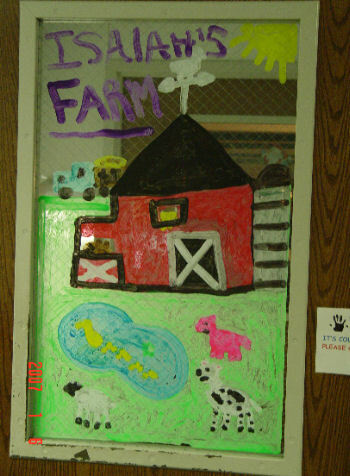 They asked if Devon could please paint their son's door before he left. 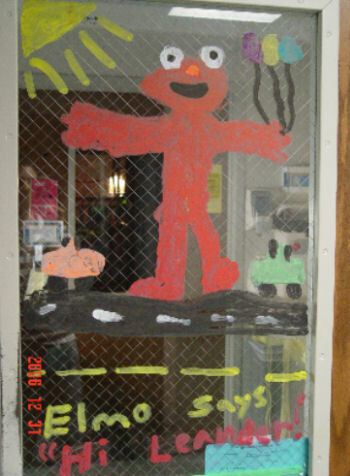 Devon asked how old their son was and what he wanted on his door. They told Devon that he loved Spongebob, but they weren't sure if that might be too difficult for Devon to draw. 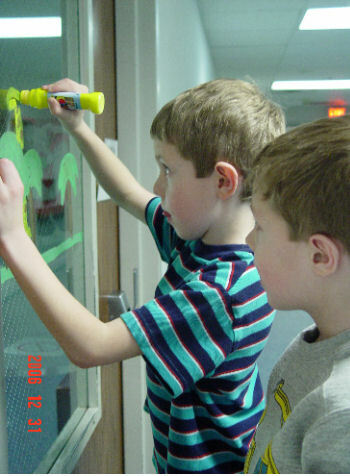 I said that it was getting rather late and we would love to decorate his door, but since the boys had school the next day and Dave had an hour's drive home, there might not be enough time that night. The mother's face crumpled and she quietly told me her son had a brain tumor and wasn't expected to make it. Needless to say, we made time. I gently explained to Devon that this 14-year old boy was really sick and he probably wasn't going to live much longer. I said he should do his best and that it sounded like this boy's family really needed something cheerful on the door since they were going through a very sad time. Devon is a perceptive kid. The importance of the moment wasn't lost on him. He set to work painting, having to pause every time the door opened with the traffic of people walking in and out. 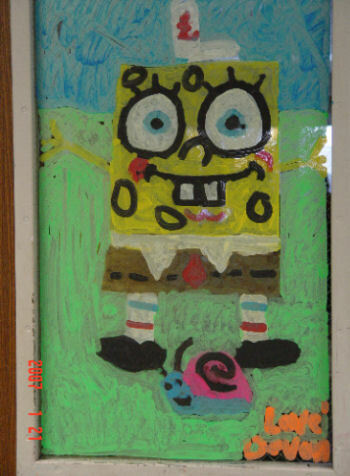 He spent over an hour creating a Spongebob masterpiece, making sure it was done to his satisfaction. The boy's relatives invited us in to meet their son. Devon was hesitant at first, especially knowing how serious the situation was. He walked over to the bed, said hello, and shook the boy's hand. 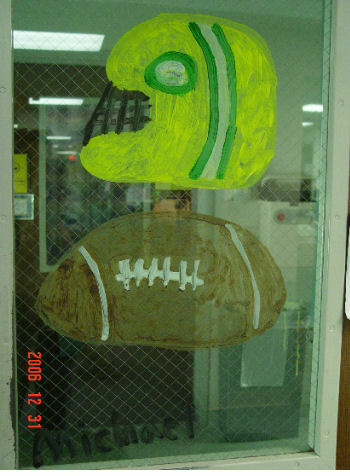 The parents were exclaiming over what a fantastic job Devon had done on the door and their son thanked Devon for painting Spongebob. Devon smiled and simply said, "I'm glad you like it. Spongebob is one of my favorite things to draw." We said goodbye and the boy said softly to Devon, "I sure hope your baby brother gets better." The rest of the week, whenever I stepped out into the hallway, the parents and relatives would fill me in on his condition. They gave me a photo they had taken of Devon standing next to his finished door. And always, they enquired after Jaymun and expressed happiness that he would probably be able to go home soon. Our oldest, Ben, also got the opportunity to meet this young man. On the drive down to the hospital, we talked together about the incredible responsibility the living have to make the most of their life. Ben was clearly struggling with the concept of being the exact same age as this other teenager and how their two lives were so vastly different. We talked at length about how this boy would never be able to experience all the "firsts" that Ben would be able to look forward to--first car, first job, first date, first kiss, first home, first child, etc. Ben said, "It all seems so unfair, doesn't it? And he knows he's going to die, Mom? He has to think about how he'll never get to do anything else on this earth, ever? What must that feel like?" I could see the impact of this reality sinking into him, how this boy would be fourteen forever. I don't think it's ever too soon to impress on our children that life is a gift and it's the worst kind of tragedy to waste it. We learned early last week that Bobby passed away. I don't know much more about him than the fact that he dearly loved Spongebob and he was compassionate enough, even at the very end of his own life, to express the hope that our baby would beat the odds. I know nothing of his hobbies, his interests, his dreams. I have no idea what sort of person Bobby might have grown up to become. I just dearly wish he would have had the chance to find out.